This small and lightweight device is equipped with a memory that can store more than 15.000 barcodes. With a weight less than 30 grams, it can be put in every pocket and taken everywhere. Using the OPN2001 is straightforward. No special training is needed as users only need to press a trigger key to operate and a reset key to control mistakes. Using the USB lead, it is a simple procedure to send the data to a PC after having configured your reader using the set-up booklet. The battery can also be charged using this cable. The OPN 2001 is big on features yet is currently the smallest bar code data collector on the market at a very competitive price. Measuring just 62 x 30 x 16mm and weighing only 28grams, Opticon’s new OPN2001 is fitted with Opticon’s latest generation of 100 scans per second laser engine and boasts the same features that can be found on many of the larger, more expensive competitors terminals. The on-board 512K of Flash data memory ensures that thousands of codes can be stored securely. 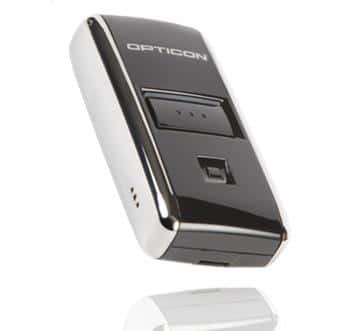 The USB interface acts not just to communicate but to charge the built-in Li-Ion battery of the OPN 2001. There is also an integrated real time clock to facilitate date and time stamping. Opticon’s OPN2001 bar code data collector is the ideal solution for scanning assisted ordering, market research consumer panels and event recording.